Mopar will offer hundreds of new parts and accessories for Chrysler, Jeep, Dodge Car and Ram Truck vehicles in 2010. The brand will be showcasing its new hardware at the 2009 Specialty Equipment Market Association (SEMA) show in Las Vegas next week. "With hundreds of new parts and accessories for 2010, Mopar continues to grow its catalog of proven, quality-tested parts and accessories," said Pietro Gorlier, President and CEO, Mopar Service, Parts and Customer Care, Chrysler Group LLC. "And with our Mopar eStore, customers will have the ability to conveniently order parts and accessories online and have them delivered to their doorstep." Mopar accessories and parts feature precise fit and finish and are designed and engineered to meet all of Chrysler Group LLC's original equipment specifications and quality standards. Following are highlights of all-new, authentic Mopar parts for 2010. See www.mopar.com for catalog information and downloads. With online ordering, Mopar will make it easy for consumers to purchase authentic parts and accessories. Beginning next month, consumers may log on to the Mopar eStore at www.mopar.com and purchase any of the more than 100,000 parts and accessories available for a variety of Chrysler, Dodge, Jeep and Plymouth vehicles. "Over the past year, approximately 40 percent of consumers who were in the market to purchase parts and accessories have shopped online," said Gorlier. "Our Mopar eStore addresses this market and will be a critical sales channel for the brand." Mopar will ship parts anywhere in the U.S., including Alaska and Hawaii. Delivery time will vary depending on the shipping method selected and part availability. Typically, consumers can expect to receive their merchandise within two to five days. Mopar will debut FLO TV Auto Entertainment at SEMA. Starting in late December, Chrysler, Jeep, Dodge Car and Ram Truck customers may watch many of their favorite TV programs with the purchase of a dealer-installed mobile TV option from Mopar. Chrysler Group LLC is the first automaker in the United States to offer live mobile TV with up to 20 channels. The service offers something for everyone: college and professional sports, breaking news, children's shows, primetime sitcoms, reality TV and daytime dramas. The entertainment package will be available on Chrysler, Jeep, Dodge Car and Ram Truck vehicles as a dealer-installed option. It also may be added to original-equipment entertainment systems on select 2008-2010 model-year vehicles. Mopar's suggested retail price is $629 plus installation. A one-year pre-paid FLO TV subscription is included with installation. Mopar will get racing and off-road enthusiasts buzzing with its enhanced lineup of engines and components, which includes the industry's first aluminum HEMI® engine blocks. Mopar will offer three aluminum versions based on the popular 6.1-liter block, all of which are up to 98 pounds lighter than the cast-iron production version found in the company's SRT8 products. The first all-aluminum option is a 6.1-liter HEMI block -- a direct replacement for the factory production cast-iron 6.1-liter HEMI engine block. The second option is prepped for a 426 cubic-inch (~6.9-liter) engine and the third option is an engine-builder's special or "X Block," which has rough-machined bores that allow for up to 468 cubic inches (~7.6-liter). Beyond the new aluminum HEMI engine blocks, Mopar will continue to support the traditional enthusiast with a broad range of HEMI crate engines including the 6.1-liter V-8, 5.7-liter V-8, 426 cubic-inch V-8, 472 cubic-inch V-8, 528 cubic-inch V-8, plus a new 572 cubic-inch V-8. With 650 horsepower and a monstrous 660 lb.-ft. of torque, the 572 cubic-inch HEMI is the centerpiece of Mopar's crate engine program. 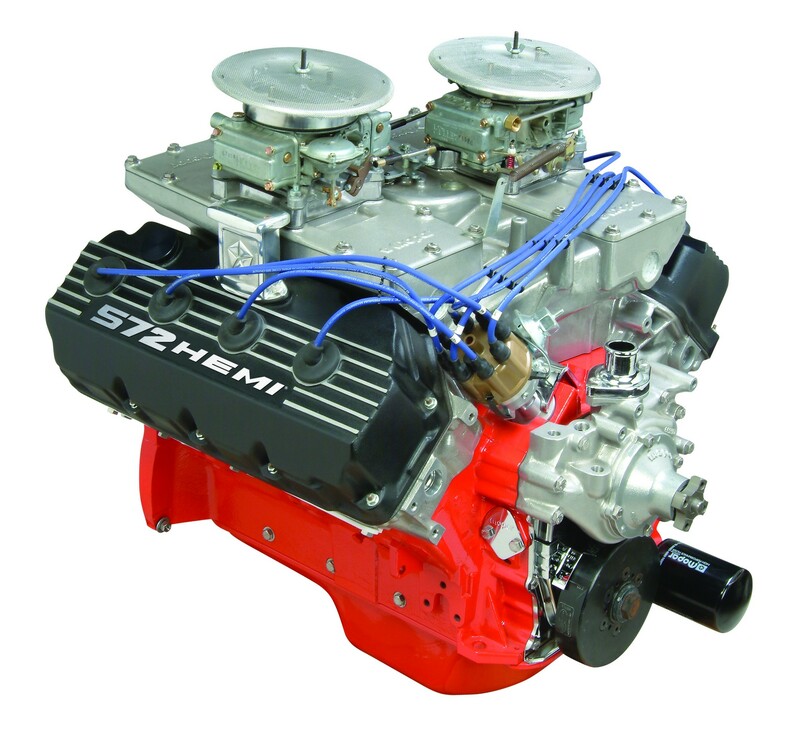 It continues the heritage of the 1960s HEMI engines made popular in vehicles including the Plymouth Barracuda "HEMI 'Cuda", Plymouth Satellite and Dodge Charger. 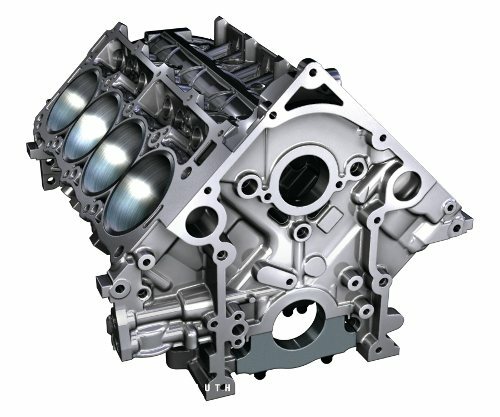 Mopar will also introduce a new 4.7-liter I-6 Stroker long block, a powerful upgrade for the 4.0-liter I-6 made famous in Jeep vehicles built from 1991-2006. Because off-road enthusiasts appreciated the dependability and performance of the previous 4.0-liter engine, Mopar developed a more powerful engine that delivers an expected 265 hp and 290 lb.-ft of torque. The engine will fit in any Jeep vehicle previously equipped with the 4.0-liter I-6 engine. Mopar (a simple contraction of the words MOtor and PARts) was trademarked for a line of antifreeze products in 1937. It also was widely used as a moniker for the CMPC. The Mopar brand made its mark in the 1960s -- the muscle car era. The Chrysler Corporation built race-ready Dodge and Plymouth "package cars" equipped with special high-performance parts. Mopar carried a line of "special parts" for super stock drag racers and developed its racing parts division called Mopar Performance Parts to enhance speed and handling for both road and racing use.